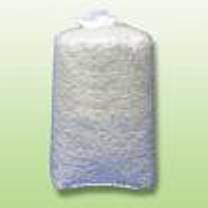 Anti-Static Packing Peanuts - 20 Cube / 155 Gal Bag Size. We offer a master unit, which is 20 cubic feet that we bring in direct from the plant. A 20cu bag is the largest size we carry and the largest size produced. A master unit is a factory direct bag with 20 cubic feet of peanuts and has a total weight of 4.00 to 4.04 pounds. The size is equivalent to a 155 gallon bag, which is nearly the size of three 55 gallon barrels. The bag is larger than an average teen and will last a very long time. If you require smaller units, such as 3 or 5cu, please contact an account executive for pricing. We can provide packaging for any size. If you do a lot of shipping and/or run an eBay home business, packing peanuts are the most cost effective way to protect the contents you're shipping. The 20 cu bags are too large to ship through standard couriers, so local delivery or pickup is the only choice on this item. Are we the BEST price? Do the math. U-Haul charges $4.95 for a 1.5 cubic feet bag. To buy the same of amount of peanuts that we sell in a 20 cubic feet bag, it would cost you $65.00. Actually got this bag for $17.50. Unbelievable price for such a large bag of peanuts.